Oz is a world-class entertainer and one of the busiest mentalists in the country. He developed an interest in magic at a young age and what started as a hobby quickly became a lifelong passion. After a couple of years spent working on Wall Street, Oz decided to pursue his dream and become a full time entertainer. He has now been dazzling audiences with his unique mind-reading ability for over a decade. Oz’s client list reads like a who’s who of politicians, professional athletes, A-list celebrities, and Fortune 500 companies. His natural charisma and charm make him the perfect choice for corporate events and private parties alike. 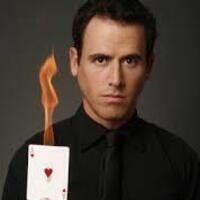 Oz’s unique blend of mentalism and mind-reading create an interactive experience that is redefining the very nature of a magic show…one that truly needs to be seen to be believed. In the summer of 2015, Oz was featured on TV’s number one rated show, America’s Got Talent. Week after week, he captivated the country with never-before-seen mentalism routines and quickly became a fan favorite, finishing in third place out of thousands of acts. Oz has also appeared on a variety of both national and international networks, a few of which include NBC’s Late Night with Jimmy Fallon, The TODAY Show & ABC World News and been profiled in Forbes, The New York Times, to name but a few. When he isn’t blowing the minds of audiences around the world, Oz is an avid marathon and ultra-marathon runner, having completed such grueling races as the Badwater 135 Miler, Hawaii Ironman World Championships, Western States 100 and Spartathlon. He takes great pride in his marathon PR of 2:23:52 and has won dozens of races throughout the country. This event is free and open to the public. If you have questions, or need to arrange disability accommodations, please contact the Center for Student Engagement at (865) 974-5455. This program is funded in part by the Student Programming Allocation Committee (SPAC). I was like "How?, But How?, How is that possible?, Wow!" all the show time!